As MPs finish up their work on Parliament Hill before heading off for the summer, the New Democrats and Conservatives remain neck-and-neck in national voting intentions, with the battle lines being drawn in Ontario and British Columbia. 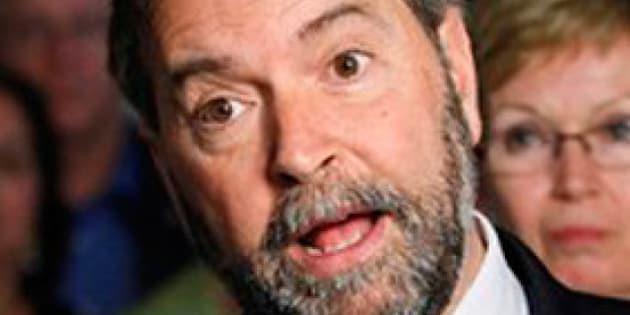 A new poll by Harris-Decima for The Canadian Press conducted June 7-18 puts the NDP one point ahead of the Tories with 32 per cent support. The Liberals trail in third with 23 per cent. The Greens and Bloc Québécois pull up the rear with seven and five per cent of national support, respectively. Compared with Harris-Decima’s last poll, taken between April 26 and May 6, the New Democrats have slipped two points, while the Conservatives are up one and the Liberals are up three. Considering the margin of error, however, none of these shifts in support are particularly significant, suggesting the parties mostly tread water over the last six weeks. But a look at the polling firm’s results over the last year shows much more variation. When the House of Commons was last preparing to lift for the summer in May 2011, the Conservatives held a five point lead over the New Democrats with 38 to 33 per cent support. Coming off their disastrous electoral showing of May 2, the Liberals garnered only 15 per cent support in Harris-Decima’s polling. Though the New Democrats are down from those numbers, they have not suffered nearly as much as the Tories have over the first year of their four-year majority mandate and are, relatively speaking, in a much better position. The NDP is also better placed than it was shortly after the Christmas break, when the party was in the midst of a leadership race and trailed the Tories by three points. Ontario and British Columbia are emerging as the two most important provinces in the on-going fencing match between Stephen Harper and Thomas Mulcair. The New Democrats have been leading in most surveys in British Columbia but the margin is narrow, with Harris-Decima putting the NDP at 36 per cent to the Conservatives’ 33 per cent. The stakes are potentially very high in the province, due to as many as a dozen seats being at play for the two parties. These alone are enough to deny the Conservatives a majority government come 2015. While the Conservatives have yet to lose the outright lead in Ontario in any poll, their advantage has been whittled down significantly by the NDP. Harris-Decima gives the Tories a one-point edge over the New Democrats with 33 to 32 per cent support, but with the Liberals at 29 per cent the race is close enough to potentially put any of the three parties in the lead in the province. Ontario handed Harper his majority in 2011 and, unless things drastically change, the province (and especially those in the suburbs of Toronto) is likely to decide who forms the next government in 2015. The first round in the four-year boxing match has to go to the New Democrats, who have overtaken the Conservatives in national voting intentions. They have positioned themselves as a legitimate alternative to the Harper government and have made significant gains in Atlantic Canada, British Columbia and Ontario, all the while holding on to their historic gains in Quebec. The Conservatives have a long time to turn things around before 2015, and with a cabinet shuffle expected before the fall they may hope to turn the page on what was a very rough year.